The memory of martyrs is exalted, but to what purpose? Banner in San Salvador. Credit: Claudia Horwitz. All rights reserved. Our delegation gathered at 7 o’clock on a Saturday morning for a prayer circle in San Salvador. We had traveled from Latin, Central and North America, drawn by the life, death and message of Archbishop Óscar Romero. This group of 30 people had come with hundreds of thousands of others for Romero’s beatification at the end of May, 2015, the third step on the path to sainthood in the Catholic Church. After the opening prayer, people were invited to share some words with the rest of the group. Many had grown up in El Salvador and had left during the massacres and disappearances of the country’s civil war from the late 1970s through the early 1990s. Most have lost loved ones, including parents, siblings and friends. Some were involved in the sanctuary movement in the USA, a network of congregations that provided safe harbor for those escaping from El Salvador and other parts of Central America. All are committed to the struggle for liberation. I was invited to El Salvador in my capacity as Interim Director of the Rothko Chapel, an ecumenical space for contemplation and human rights work in Houston, Texas that houses 14 monumental canvasses by Mark Rothko. My companions include my 15 year-old goddaughter, my co-worker, and Sissy Farenthold, an older activist who has made a dozen trips to the country to monitor elections, support the mothers of the disappeared, witness the peace accords of 1992, and support Romero’s legacy. The Chapel itself has a long history of support for Central America and gives the Oscar Romero Award every two years to recognize organizations and individuals who—at great risk to themselves—have denounced violations of human rights. Everywhere we go there are palpable signs of people's love for the Archbishop. The history of violence and loss in the country is pervasive, but so too is the universal connection to Romero’s spirit and his work. Just as most El Salvadorans have experienced the loss and trauma of war, so they have first-hand accounts of his presence. Romero served someone’s first communion, performed their baptism, or ensured that spaces controlled by the church were places of protection that kept people alive. In a country of five million people, the degrees of separation must be measured in fractions. People have come back for the beatification because Romero—already a saint in the eyes of many—represents the best of humanity. “I believe in reconciliation and in forgiveness; without forgiveness there is no reconciliation,” says Gloria, whose sister was killed by the death squads when she was a high school student. The war in El Salvador has left many legacies, including loss of life and hope, and the normalization of violence. Gang-related killings are common, and the country has one of the highest rates of intentional homicide in the world: 41 out of every 100,000 citizens compared to 4.7 in the USA. The United States has played an important role in these patterns of violence, from arming regimes in the 1980s to pressing for an end to the death squads in the early 1990s to the recent decision by El Salvador’s business community to hire Rudy Giuliani, the ex-Mayor of New York, to advise them on how to respond to gang violence. The legacy of secrecy also lives on: the Archbishop of San Salvador has closed the archives of the archdiocese so no one has access to the information it contains. Perhaps ironically, Romero was not a lifelong revolutionary. For much of his vocation he was a conservative priest, in many ways more focused on Church doctrine than on social issues. But his outlook and actions began to shift as he experienced more of peoples' struggles for economic and physical survival, and witnessed the disappearances of so many. Arguably, the most transformative moment in his life was the murder of his friend and fellow priest, Father Rutilio Grande, in 1977. While organizing farmers, Grande became an outspoken critic of the government. After his death, Romero cancelled all masses in his archdiocese and instead celebrated “Misa Unica” (‘one mass’) at the Cathedral of San Salvador. Over 100,000 people and 150 priests attended. From this point onwards, Romero’s pastoral work was reoriented towards the “preferential option for the poor,” one of the central teachings of liberation theology. A clear threat to the country’s oligarchy and to the patriarchy of the church, Romero was assassinated on March 24, 1980 in his home church at the Hospital of the Divine Providence. Although no one was ever prosecuted for his murder, it is widely believed that the killers were part of a right-wing death squad led by Roberto D’Aubuisson, a military intelligence officer. From our hotel, we make the short trek to the Savior of the World Plaza in San Salvador for the beatification ceremony and mass. As we walk, the streets fill up with more and more people all heading in the same direction. Some have come in large groups with banners, some with their families. There are posters and trinkets and bottles of water for sale. We get closer and the crowd thickens. Everyone is full of joy. We’ve been given passes to a special seating area, but to get there we have to press through the ever-growing crowd. “Passa, passa” people shout as they surround us, creating a small aisle through which we can squeeze. There is much generosity and only a few looks of confusion. At one point someone pulls me past two elderly nuns into the reserved seating area, and it’s all I can do to follow them rather than yanking off my pass and giving it to one of the nuns instead. The beatification is beautiful though surreal. A parade of dignitaries from El Salvador, Rome, and all over Central America have come to pay homage to a man who was given little support from the Catholic church when he needed it the most. Now, there is hope that the beatification might bring the church in Latin America to life more fully, and that Romero’s legacy will be universalized in the region. Materials and relics from his life and work will be sent to parishes throughout Central America. His memory will be exalted, but in what form and to what purpose? One of the most important stops during our visit is the parish of San Antonio in Soyapango, an area with high levels of gang activity. The church here serves a vital function in the community. Young people gather there to create their own media. A group of mothers run their own bakery and make a kind of cornbread desert that makes my mouth water. We’ve raised a small sum of money to support their work, and there’s a possibility of creating a longer-term sister-to sister relationship with them. At the Monseñor Óscar Arnulfo Romero International Airport outside San Salvador we walk to Gate 10 to see a mural that was dedicated to the Archbishop in 2010 by the country’s then-President, Mauricio Funes, marking the first time his legacy was embraced in a public forum. Someone tells us that a nun at Gate 5 has a once-bloody handkerchief that Romero had with him when he was killed, and that it’s helped to heal her cancer. We can’t help but seek her out. She’s called Anna Maria, and she’s generous with the precious piece of cloth, allowing us to touch it and showing us where “Oscar” is embroidered. One of my traveling companions muses about the power of faith and belief. Who knows whether the handkerchief has any powers? 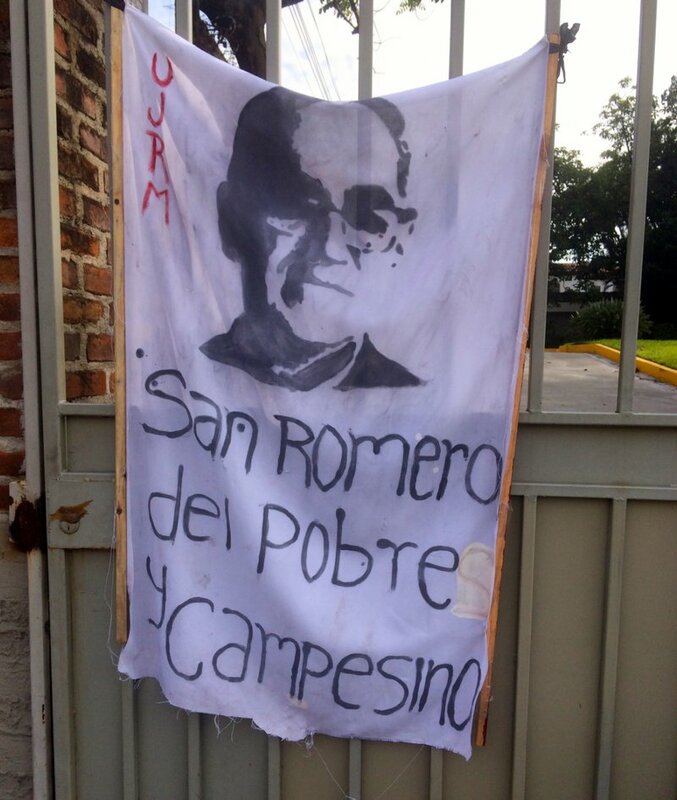 The real point is that Romero's life has continued long after his death: he has become an even more potent icon of transforming love, the kind of love that’s required to bring about social and economic justice. And that is certainly a miracle of its own.